Most Pastors work hard at motivating their people to put their faith into action. That’s why many clergy like the CROP Hunger Walk. The CROP Walk gets people off their chairs and actively involved. One of the CROP aphorisms is, “We walk, because they walk.” In other words, many people in third world countries have to walk miles in order to get drinking water. By walking in the CROP Walk, not only is money raised to help drill wells and provide filtration systems, but it helps the walkers identify with the people they are serving. Simply writing a check doesn’t do this. It’s much easier to motivate parishioners to participate when they learn that one quarter of the money raised will remain in their area. In our case, thousands of dollars last year went to West Suburban PADS and several local food pantries. While a pastor might not completely agree with the theologies of colleagues down the street, most clergy earnestly want to model love of neighbor, which of course includes people of other faith traditions. Last year we had Muslims, Jews, agnostics and many varieties of Christians all walking together in a common cause. Join us on May 1, 2016 to make a difference in the lives of fellow citizens and citizens around the world. Your steps make a difference. Click on this link to join the walk. As folks who have supported Hunger Walkathon West in the past, we ask you consider attending a special brainstorming meeting on November 4th and bring a friend! See below & feel free to pass this on to other interested community members. You are invited to a SPECIAL CROP Hunger Walk Meeting! For 32 years, Hunger Walkathon West has been raising money for CWS/CROP and local hunger fighting agencies. The Walk has raised over 1 1/2 million dollars to alleviate hunger and improve the lives of our brothers and sisters around the world. In 2015 alone, the Walk raised $70,000. Of the $70,000 25% comes back to local food pantries and other hunger fighting agencies. We are meeting to decide the future of Hunger Walkathon West – please join us as we make our Walk stronger and plan how we can end hunger. No commitment from you beyond the meeting – just come and bring a friend! Jon Skogen, Senior Community Engagement Specialist with Church World Service will be attending and leading the group discussion. Thanks in advance for your thoughts and ideas! RSVP: Please email jdespotes@gmail.com or to let us know you will attend! We posted this a few years ago but it is still relevant in our efforts to help those in need of food. We ask you to share this with your friends and family, especially young people as a way of having their voices heard in this 32nd annual CROP Hunger Walk. Joining the walk is just as easy to click on this link which you can then join as an individual; join a team or just make a donation so as to make a difference. 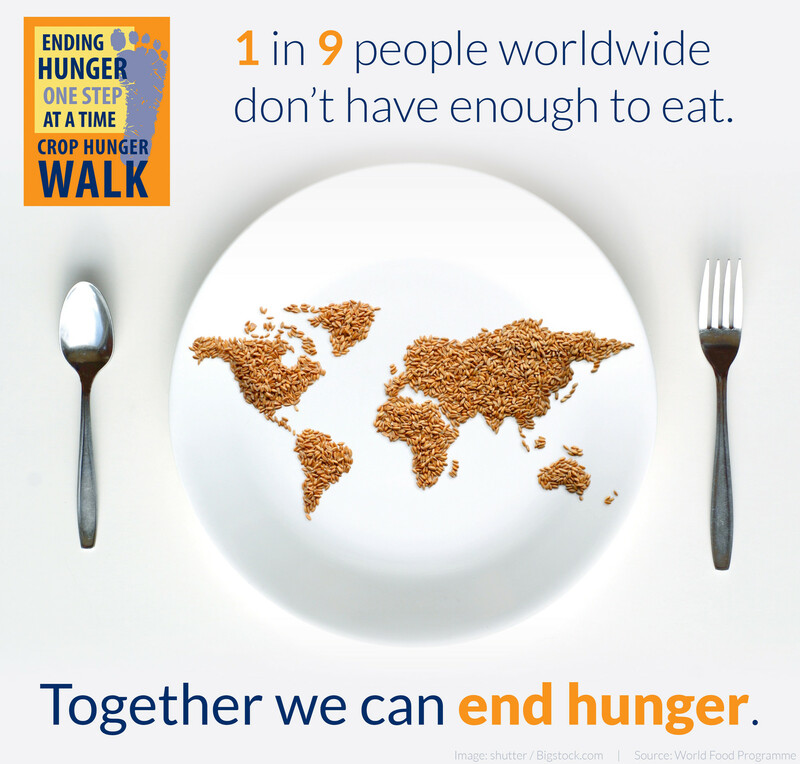 We are all walking Ending Hunger One Step at a Time. How easy is it? Well see this video is on how easy it is to give online; setup a team and let your family and friends know about donating online for the CROP Hunger Walk in Oak Park, River Forest, Forest Park and Austin. The Walk is Sunday, May 3, 2015. Signup now and donate. It’s Just That Easy. Have questions or need help – fill out the form below. A week ago we had the privilege of having a table at the Oak Park Day In Our Village annual event. On June 1, 2014 we were able to talk to people about the CROP Hunger Walk and from those discussions 15 people signed up to volunteer and get involved in our efforts. If you wish to be involved, please fill out the contact form below. Please stop by our table at the Day In Our Village, Sunday, June 1, 2014 from 11:00 a.m. to 6 p.m. We will be in Scoville Park along with many other community organizations. Our table #51 is located just west of the monument circle. 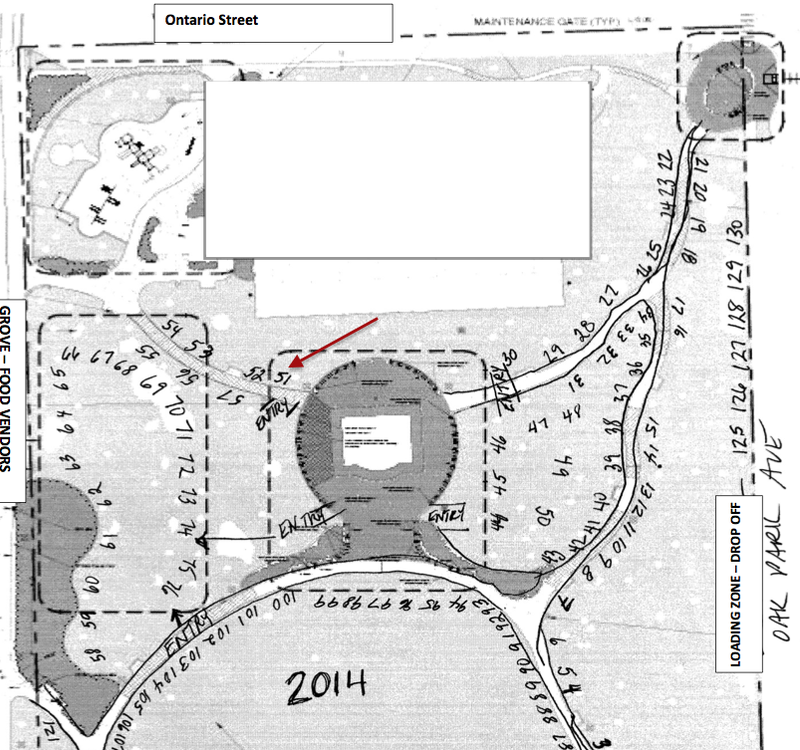 Easiest entry to visit us on from Grove St., just off Ontario Street. Enter near the playground and we are on the left hand side of this entry way. You have seen our signs around Oak Park, River Forest and Forest Park for the 31st annual CROP Hunger Walk. Now you can come talk to us about what it is that we do. Get information about the work we do to help local agencies and needs around the world. Can’t make it to Day In Our Village, then please fill out the form below to contact us about your questions and/or interest in volunteering. Wouldn’t it be nice to know that everyone in our community and around the world has enough food on their table to nourish their family? For over 30 years, the annual CROP Hunger Walkathon West has helped to move closer to making that vision a reality. Over the years of the local CROP Hunger Walk, we have raised more than $1.1 million to help alleviate hunger – we are very proud of that history. The CROP Hunger Walk is an annual community event sponsored by Church World Service and organized by local congregations. The Hunger Walkathon West CROP Walk includes more than 30 caring churches, schools, and organizations in Oak Park, River Forest, Austin, and Forest Park – all working together to help fight against hunger. More than 400 individuals participate in the Walk each year. It has become a prized annual tradition. Thanks to our amazing Recruiters and Walkers, last year we raised over $62,000 – the most funds raised in all of the State of Illinois CROP Walks! As the need has grown larger, we have set a goal for 2014 of $75,000. Therefore, this year we have joined in the Feinstein Foundation Challenge. For each dollar received by our CROP Hunger Walk before May 1st, the Foundation will divide $1 million among hunger-fighting agencies – so every dollar counts even more! These funds support the amazing work of Church World Service, which works with partners to eradicate hunger and poverty and promote peace and justice around the world. They provide sustainable grassroots development, disaster relief, refugee assistance, and educate and advocate on hunger-related issues; both here in the U.S. and abroad. And 25% of the proceeds are distributed to the following eight local agencies right here in our own community: Cluster Tutoring, Forest Park Food Pantry, Oak Park-River Forest Food Pantry, Pine Avenue Food Pantry, Prevail, Proviso Food Pantry, St. Eulalia Quinn Center Food Pantry, and West Suburban PADS. These agencies provide much-needed services to our community and they are so appreciative of the help we are able to give them through the outstanding efforts of all those involved in the Crop Walks, especially now when the need is greater than ever! Feel free to check out our Website at if you would like more information on the local agencies we support. • Setting up a “Team” page Online, then advertising in your Newsletter, Bulletin, and Website that people could donate that way. To learn more about our efforts to alleviate hunger or how you can get involved, please visit our website at.